Cet appartement de deux chambres peut accueillir 4 à 6 et est une base idéale pour explorer la région. Ceci est un excellent emplacement sur la belle Cap d'Antibes sur la Côte d'Azur et une base idéale pour un séjour de détente au soleil, à proximité des belles plages de Juan les Pins et Antibes. Il ya une piscine communautaire sur place et une superbe terrasse privée. Antibes est également à la maison à un musée Picasso, remparts du 17ème siècle, un marché d'antiquités avec de nombreux bars, cafés et restaurants. Les plages et les environs offrent une multitude d'activités sportives et touristiques pour tous les goûts. Ceci est un endroit idéal pour les familles avec de jeunes enfants ou des amis en vacances. Notes sur le logement: L'appartement dispose également wifi. L'appartement dispose d'un garage À l'extérieur: Il y a une grande terrasse wrap-around avec accès par les deux chambres, le salon et la cuisine. L'appartement bénéficie également de l'utilisation d'une piscine commune (non chauffée, fermé hors saison) et des terrains communaux. Buanderie: Des chaises longues, fer et planche à repasser. Service de nettoyage / serviettes / / Femme de ménage: Les serviettes et les draps sont fournis, la propriété est nettoyée tout au long avant chaque location. Merci à chantal pour son accueil, sa gentillesse et pour l'appartement d'une propreté irréprochable. A lovely, spacious apartment with everything needed for a lovely, relaxing holiday. This apartment was in a perfect position, being only a short walk from Juan le Pins or Antibes and also the local station and supermarkets. The apartment itself was well equipped with everything we needed and the large balcony was an excellent outdoor space. Chantal, who looks after the property, was extremely helpful and friendly. She made sure we knew exactly how to contact her had we needed to during our holiday, although I am pleased to say this was never necessary. The only reason I haven't given 5 stars was the lack of air conditioning. It was extremely hot whilst we there and, although we left the doors open, it did make for some uncomfortable nights. However, all in all, this was a lovely apartment, we had a great holiday and we would definitely go back. The apartment was well maintained located in an area within walking distance to shops, public transport and the beaches. The apartment is equipped with items that made our stay a lot more pleasant and convenient such as a washing machine, washing powder, even tea bags and sugar - which was helpful as we ran out of our own sugar that we'd brought, beach umbrellas, shopping trolley - very handy when it came to food shopping. In essence, it was like being from home to home. Great location - we were able to walk to most places; Anitbes old town 20mins, beaches 10mins, bus stop/train station 10 mins.NB: If you have no time constraint get bus 200 from Nice airport as it is the cheaper option as opposed to the airport express bus or train. There are several supermarkets nearby including Carrefour. The only downside was there were no air con or indeed enough fans in the apartment. At night it was sweltering - temperature on most nights were above 26 Celsius and it made for very uncomfortable sleeping. We had to leave the shutters up to allow some air to flow through but that meant compromising on security. And the other thing I'd like to mention, albeit minor, is the bed sheet on one of the beds was quite bobbly and scratchy which my made for an uncomfortable sleep for my daughter. In all, we really enjoyed our stay in Juan les Pins and the apartment so we'd not hesitate to rent it again. We had a lovely holiday here, 2 weeks in August. 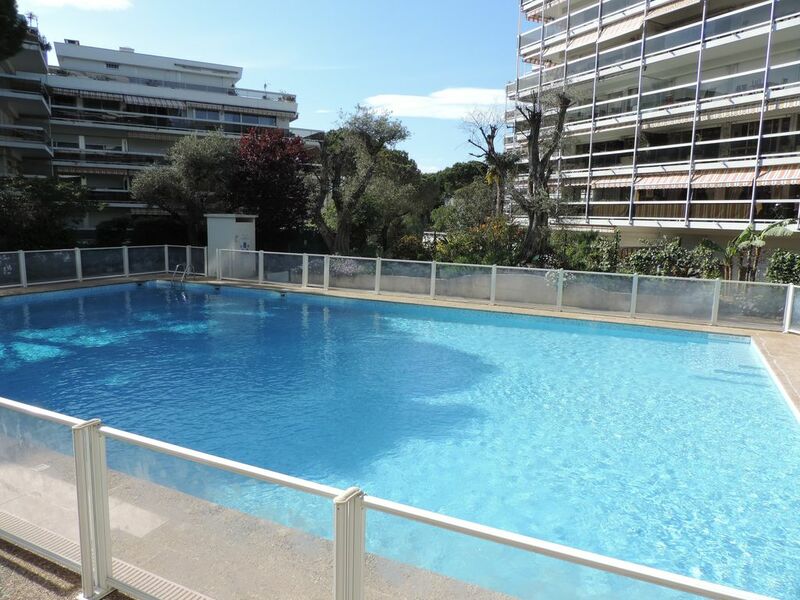 The location of the apartment is ideal - an easy walk to both Antibes and Juan le Pins, and close to the station. The apartment was well equipped and had everything we needed, the balcony was a real bonus - so much space, we enjoyed many meals and relaxing evenings there. In high season it's worth booking the good restaurants in the evening, and sun beds at the beaches. Would highly recommend Albert 1er in Antibes, and Cap Riviera in Juan les Pins for quality meals. We had a great time in Juan-les-Pins! The apartment was well-furnished and clean, and within walking distance of both the shops in Juan-les-Pins, and of Antibes, a little further in the other direction, and only 10 minutes walk from the beach. The wide wraparound balcony was fantastic for lazy lunches and siesta time when it was too hot to go out! The only reason I didn't give this apartment 5 stars was the lack of an information folder, which we have found in most places we have stayed, with info on the apartment, such as the wifi code, as well as local maps and information (where to buy food etc). Chantal, who greeted us on arrival was very friendly and helpful, but it is difficult to take things in after a hot day's travelling, so written info would have been useful. Les plages de Juan les Pins et Antibes sont moins de 10 minutes à pied de l'appartement. L'aéroport le plus proche est Aeroport de Nice Côte d'Azur, à 45 minutes en bus ou à 25 minutes en voiture. 5 minutes à pied d'une boulangerie, des chimistes et des commerces locaux. Ceci est un endroit fantastique pour un certain nombre d'activités sportives - y compris le ski nautique, la voile, la planche à voile, canyoning, VTT. Check-in from 4pm, check-out by 10am. Minimum stay is 7 days but out of season this can be flexible depending on availability.